The 710 terminus at Valley Boulevard along the Los Angeles-Alhambra border. Credit: Google maps. Looking to solve one of the region’s most vexing freeway problems, the Metropolitan Transportation Authority Board of Directors will consider next week launching a new round of environmental studies on how best to improve traffic caused by the 4.5-mile gap in the 710 freeway between Alhambra and Pasadena. The initial study would consider a variety of fixes — ranging from traffic improvements on surface streets to a freeway tunnel, which in recent years has been the focus of most discussions involving the 710 gap. The 710 opened between Long Beach and Valley Boulevard on the Alhambra/Los Angeles border in 1965. The goal, at the time, was to complete the freeway to Pasadena but controversy and lawsuits stopped a surface-level route that would have required the demolition of hundreds of homes, including some historic properties. In the years since, traffic between the 710 in Alhambra and the stub of the freeway in Pasadena at the junction of the 210/134 freeways has shifted to other freeways and surface streets. Among the hardest hit has been Valley Boulevard and Fremont Avenue in Alhambra, causing city officials there to complain that residents who live near both roads must live with heavy traffic volumes, noise and air pollution that would not exist if the freeway had been completed. Two members of the agency’s Board of Directors — Duarte Councilman John Fasana and Supervisor Gloria Molina — submitted a motion on Thursday asking that the full Board of Directors launch a scoping study that would consider the various options to improve traffic in the area of the 710. The scoping study would be wide-ranging and would likely consider, among other ideas, a surface route, a tunnel, improvements to existing roads and mass transit, and a high-tech rail corridor along the freeway to handle freight from the ports of Long Beach and Los Angeles. The Board of Directors meets Thursday, April 22, at Metro headquarters adjacent to Los Angeles Union Station. The meeting is open to the public and is scheduled to begin at 9:30 a.m. The idea, in other words, is look at everything and advance the more reasonable options to an alternatives analysis study that would ultimately define the project. A lengthy environmental impact study complying with state and/or federal laws would then follow. The surface route — with a final environmental document ruled insufficient by the courts in 1999 and little, if any, remaining political and community support at the regional, state or federal levels — could be eliminated in the scoping process. It is little surprise that the 710 issue has resurfaced. Sixty-eight percent of voters in Los Angeles County approved the Measure R sales tax increase in Nov. 2008 that included a long slate of transit and road projects. Among them was a proposed gap closure for the 710 which Measure R defined as a tunnel and which is set to receive $780 million in Measure R funding. Measure R left it up to the Board of Directors to decide when money would begin to flow to the project. No decision has yet been made. Like the rest of the Measure R projects, however, funds would only go to the 710 project on the condition that the project is deemed necessary in the environmental review process and that it is ultimately approved by the agency’s Board of Directors. *The actual cost a tunnel, should that be pursued, is not yet known because such a tunnel has not yet been designed. Nor is it known when a tunnel would be built and what construction costs would be like at that time. *The source of the rest of the funds to construct a tunnel or any other 710 project is not yet known. The Board of Directors did recently approve a contract for an outside firm to study the potential for public-private partnerships for several projects, including the 710 gap closure. *No private firm has offered to help finance the project. There has been considerable talk in recent years — but no action — that one way to finance the tunnel would be to allow a private firm to partially finance it and recover its investment through tolls. However, no decision has been made that a tunnel, should it be built, would be a toll road. Nor have tolls been set. *It has not yet been decided where a tunnel would be located, how wide it would be, whether it would be open to truck traffic and whether there would be exits and entrances and, if so, where the ramps would be. *Nor has it been decided or seriously studied how the tunnel would be ventilated and therefore no decisions have been made about the number or location of ventilation shafts and what private or public property may — or may not — be needed to accommodate such shafts. Two tunnel studies have been done in recent years. A 2006 study commissioned by Metro looked at tunneling technology and other tunnels around the world and concluded that a 4.5-mile freeway tunnel is technically feasible. 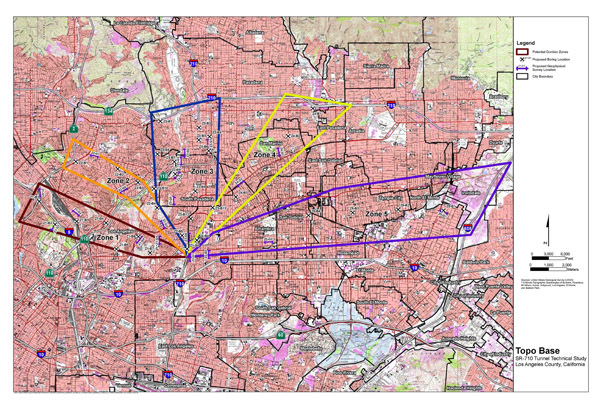 The geotechnical study looked at five different zones where a 710 tunnel might be placed. Zone 3 -- the middle one -- represents the shortest distance between the two ends of the 710. Click on map for a larger view. More recently, a geotechnical study completed this year looked at soil and seismic conditions in five different zones fanning northward from the 710 terminus in Alhambra. The study found that conditions are suitable in all five zones for a tunnel. Zone three has been of particular interest to the public and elected officials because it includes the most direct route between the two ends of the 710. It will be up to the Board of Directors to decide if the scoping process should include all the zones or just some of them. The map at right shows all the zones. 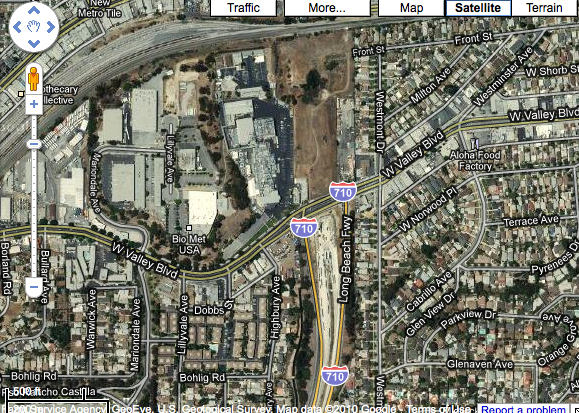 The 710 gap closure, of course, has long been a controversial project. There are citizens groups and cities on both sides of the issue and many, if not all, will likely be heard from when the 710 issue comes before the agency’s Board of Directors. The Southern California Assn. of Governments (SCAG), which advises on regional planning issues, has long supported a tunnel. A recent draft study contracted by SCAG and using SCAG modeling data examined how a tunnel would impact traffic patterns in the area in the year 2030 and the results were somewhat mixed, depending in part if other freeway improvements were also made in the area. The study assumed that trucks would be permitted to use the tunnel and was silent on the issue of tolls. Generally speaking, many surface streets and freeway segments saw improvements in traffic flow, but it wasn’t universal. A tunnel, the study found, may also increase traffic volume on the 210 north of the 134, the 10 east of the 710 and the 5 north of the 2. The study has not yet been published online.